It seems that almost regardless of what the Zelda series does, there is always going to be the select few out there that are disappointed. Evan Hembacher of Crispy Gamer is certainly one of those people and here is a tidbit of what he had to say concerning Skyward Sword. So when we see graphics that appear worse than last generation’s game, we start to question our allegiance. However, it’s when motion controls are touted as the title’s biggest feature that my BS-alarm starts to sound. This isn’t part of some anti-motion campaign that I’m running; granted, bowling on the Wii was really the only time I have actually enjoyed its motion capabilities. It’s just that Zelda represents a higher art form in the world of game design, and motion controls are still base and unrefined. Most of us logical Zelda fans would dismiss this statement in a heartbeat since well, it just seems more like a bitter fans rant about what he doesn’t like, rather than what is actually wrong with the game. The graphics are certainly different than Twilight Princess, but to say they are worse is strictly just an opinion, but if you look at the specs they are in fact superior. His distaste for motion controls seems evident and I would guess he didn’t play the E3 demo at all. There have been overwhelmingly positive reviews in terms of the motion controls of Skyward Sword with negative reactions being few and far between. This article in general just goes to show that Zelda will never be able to please everybody. So what do you think about the motion controls and graphics? Conversations like this have been ongoing over at our Skyward Sword Forum for the last two weeks and now is a great time to jump in and Register at the Forums to get involved. 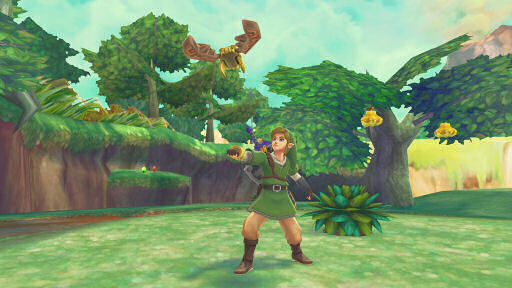 Skyward Sword is set to ship in 2011 and here at Zelda Dungeon we will be providing a complete Skyward Sword Walkthrough as soon as the game is released, so be sure to bookmark that page!